This First Friday we will celebrate the 100th birthday (Sept. 19) of one of the leading painters of the 20th century: Pablita Velarde/Tse Tsan “Golden Dawn” (Santa Clara Pueblo) (1918-2006) who was a pioneer as a woman artist in an era and a community where painting was a male art form. This exhibition contains an accurate recreation with original objects of Pablita’s working studio, giving insight to the public of this extraordinary artist’s process. Join us for two screenings (6:30 and 7:45 p.m.) of New Mexico PBS’s ¡Colores! special, “Golden Dawn: The Pueblo Paintings of Pablita Velarde” (26 mins) in the Crossroads Gallery. Learn about Pablita’s daughter, Helen Hardin, and granddaughter, Margarete Bagshaw, who are also famous women artists and engage in guided art activities inspired by their bodies of work. The Heard Museum Cantina will be open until 9 p.m. Heard Museum Books & More will be open until 8 p.m. The first 100 people to arrive will receive a birthday cupcake! Last entry into the museum is 9:30 p.m.
At the age of fourteen in 1932, Pablita was accepted to Dorothy Dunn’s Santa Fe Studio Art School at the Santa Fe Indian School, which was the catalyst that launched her artistic career. 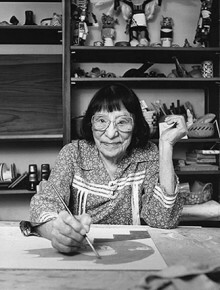 She went on to become one of the most celebrated and accomplished American Indian artists of her era. Her many awards include the Palmes Académiques from the French government, New Mexico Governor’s Award, 1990 Lifetime Achievement Award from the National Women’s Caucus for Art and being designated a Santa Fe Living Treasure. Pablita Velarde (Santa Clara Pueblo), “Deer and Aspens,” c. 1955. Watercolor on paper. Heard Museum collection. Gift of Dr. and Mrs. Oscar Thoeny.